Anyone who hasn't observed the level of activity in the Vanderbilt Rail Yards, which are intended to be part of the future site of the Atlantic Yards development, or checked in on the state of demolition work in neighboring Prospect Heights, will find that a great deal of work is being done. The photo above is one posted by Tracy Collins, who has been doing a masterful job of chronicling the progress of work. No Land Grab has a full post with photos called Ratnerville Railyard Illustrated. Yes work is starting and will continue. Neither No Land Grab or Atlantic Yards Report will have any effect on the progress. The naysayers will wail and cry but Brooklyn will get a development that will change the borough for the better. understand that this is not work on "atlantic yards." this is excavation to build a new rail yard. 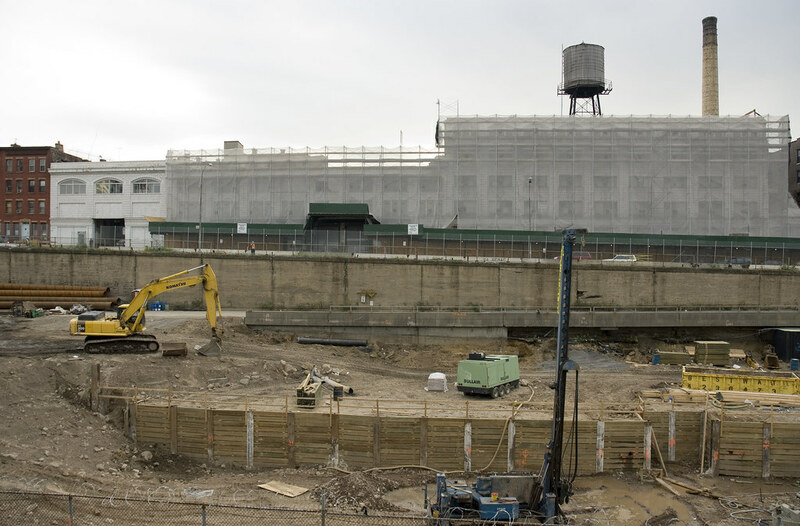 work on "Atlantic Yards" can only happen if Forest City Ratner wins the lawsuits against it. anonymous: yes, technically, this work is not on "atlantic yards", but would this work on a new rail yard be underway if not for "atlantic yards"? Of course the Gowanus moderator chose to highlight the head-in-the-sand comment by 5PM Annon. There wouldn't be any work being done without the fact that AY WILL be built!